Keep the birds pooping and the score from drooping! Hopefully you've read our Flappy Bird Beginners Guide. Because these advanced tips aren't for the feeble. With Flappy Bird officially dead, several of these Flapping clones have emerged for both iOS and Android devices. Flappy Fall and Flying Cyrus traded the top spot on the mobile game app stores, but it appears that Flappy Wings is still gliding near the top 5 with the iOS app store. We're not sure how long Flappy Wings will last, but it's enjoying its moment in the spotlight. With this in mind, check out our advanced tips on how to improve your score with these Flappy Wings tips. Making your birds beak dip slightly lower than the column before your immediate ascension, helps you easily clear each column with consistent precision. Yes, this does require some concentration but if you can flap past each obstacle easily with one or two well placed taps. Everyone has their particular style of gameplay but it's important that you tailor your style to the demands of the game. In this particular clone quick taps give you the chance to get into a rhythm while at the same time avoiding those BirdBGone laced columns. Ideally, you should only tap one-to-two times to clear a pipe. Because you're too focused to blink in Flappy Wings, less blinking equals higher scores. Make sure you keep your eyes moist with some eyedrops before starting a round and go with quick blinks between pipes to keep your eyes moistened yet firmly positioned on the screen if necessary. We've mentioned this in our previous Flappy Bird guide, but we can't stress the advantage of using a tablet to hike up the high score. Switch to the iPad or an Android tablet and benefit from a much larger screen that gives you a chance to tap wherever you want while getting a better view of the action. 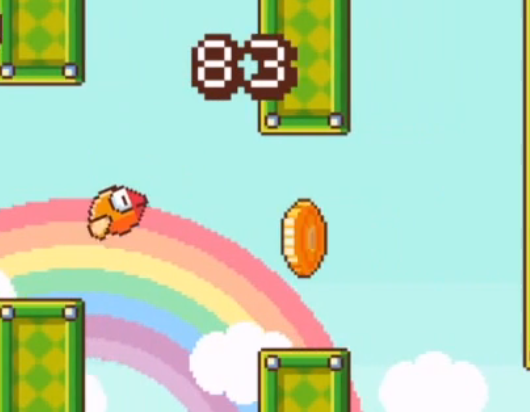 Flappy Wings will wreck havoc on your nerves and patience. So don't rage quit, it's for amateurs and you're gearing up to brag to all your friends about the new high score you got with the tips from this guide. We recommend taking a break and play something like Disco Zoo that doesn't require the same level of concentration. Switching gears when you've hit a wall will do wonders for your next high score as well as your sanity. Easier said than done, right? Let's say you have a high score of 84 and the next try you die at 83. It's frustrating and disappointing, but you have to shrug it off, restart and get flapping. Accept that you're going to fail miserably playing Flappy Wings more than you'll succeed, but take time to do the chicken dance with the occasional victory. The higher your score, the greater the clout amongst your friends but remember heavy is the head that wears the crown. Just because the game is intense doesn't mean you have to be. Staying calm under pressure is vital to getting past your previous high score. We know, easier said than done but keeping a level head when approaching your previous score will make it easier to set a new record. Remember, take it one column at a time.